Pitlochry is in the very heart of Scotland which means by basing yourself in the town you are in easy reach of Inverness, Fort William, Glencoe, Glasgow, Stirling, Edinburgh, St. Andrews, Perth, Dundee, Aberdeen and loads of other great places in Scotland. Electric Scotland is excited about showing this area in great depth so that you get a real sense of what it would be like to be based in the area. The picture above is of Pitlochry from the A9 road from Perth to Inverness which goes by Pitlochry. 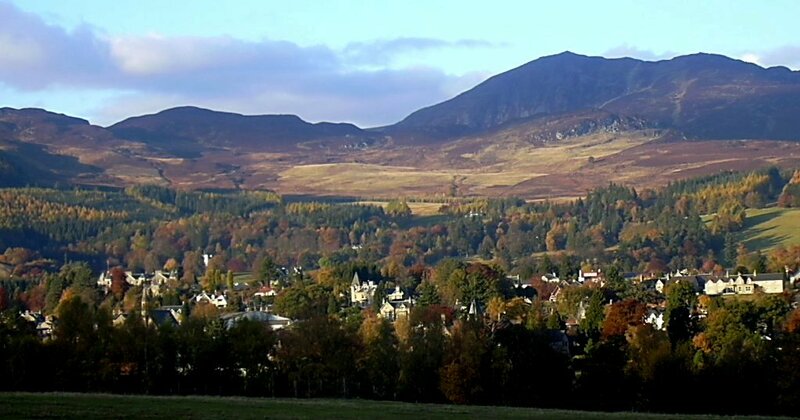 Here are some pictures of Pitlochry to give you an idea of what the town looks like. Here we're trying to give you an idea of the kind of days out you can have while staying at Pitlochry. So this section provides lots of pictures of these day outs in area like Glencoe, Inverness, Aberfeldy, Braemar, Kinloch Rannch, etc. Just for fun here are some pictures as jigsaws for the kids to enjoy. Street maps and travel directions for the UK.